I’m writing this following a Full Council meeting last night. Cllr Sam Mongon and I are working hard to try and get the Council to engage with residents and councillors on the transport plans for the Arena ahead of the actual planning application being submitted. Even though councillors voted for this, we have been met with an effective ‘No, wait for the public consultation’. I am very disappointed in this response and will continue to lobby for more information. I am particularly interested in environmental transport solutions – we urgently need to get people to travel to the Arena without using their cars if we are to have decent air quality and bring down carbon emissions. More promisingly I have been working with Parent Carers Forum to secure more funding for their fabulous ‘Let’s Go’ community transport scheme. This allows children who are disabled or have life-limiting illnesses to go out with their families and engage in the sort of activity most of us take for granted, such as visiting relatives or a cinema trip. I am hopeful that we will be able to persuade the Council to find funds to continue this service. Sam & I met with the Parks officer after several people expressed concern about long grass areas. Send your views on the new mowing schedule to parksmaintainence.review@bristol.gov.uk. I mentioned that weeds had seeded near the new path in Perrett’s Park – these are now mowed and grass-seeding will be tried again next year. Finally, over in Windmill Hill and Victoria Park, there is concern about the forthcoming Residents’ Parking Schemes in Bedminster leading to commuters parking in nearby streets where there is no scheme. Some residents would like to have an RPS and I talked to the council about this . If you agree please email me: Deborah-mila.joffe@bristol.gov.uk. The main issue has been the libraries announcement. This is a vindication of our position in that we did not want closures, but do agree that the model needs to be refreshed. The unanswered questions about the reduced cut means the cause of the cuts (coalition government austerity )will still fall on the council services, we just don’t now know where some will be. Greens will need to be extra vigilant about less ‘popular’ services being targeted that impact on vulnerable groups. The reduced hours also causes alarm as there now has to be a concerted effort to ensure new viable uses are found for every library to get hours up from the 20 hours minimum to ensure services are still open and accessible. This means new events, activities, services and perhaps local cafes bringing refreshments into spaces from local traders. This especially matters in less well-used libraries where they could meet more local needs. Greens have been closely involved in local campaigns but also recognise that the expressions of support generated by the campaigns still need to do lots of work to boost service offers and widen use. We have been pressing through Neighbourhoods scrutiny for the review of the waste collection contract (in parallel to the transfer of collection services to the new BWC) to be undertaken in a way that ensures better reduction, reuse, repair and recycling. We don’t want a standstill situation where tonnes are destined for disposal due to inaction on repair and reuse or less ambition to raise the recycling rate (eg in harder to reach blocks). On Gloucester Road we are still watching ever patiently for the completion of our new facilities at the old Bristol North Baths. At last the scaffolding is down! To mark Hiroshima and Nagasaki Days, the local CND Group wanted to replace a memorial cherry tree in the Peace Grove in Castle Park (between the ruined church and the harbour). The grove was planted in 1985 but a cherry tree had died and the plaque there was missing. Cllr Martin Fodor was able to secure practical support and agreement from the council to ensure this could take place. On August 7th, Hiroshima Day, the group planted a replacement tree and in a short ceremony re-dedicated the peace grove, added a plaque, and marked the occasion, with members of CND and passers by. They invited Martin to speak, and heard from Daniella Radice too, acting as Assistant Mayor. One of the highlights of the month was seeing the launch of 50-50 campaign for gender equality in the Council for 2016. As chair of the sub-group of the women’s commission that is running the campaign it is great to see it up and running and receiving support from most other political parties. I am working with Council Officers and street artists to update the Council’s graffiti policy. The issue is that street art is one of the things that many of us love about the city, but tagging has become an increasingly bad problem in many neighbourhoods and we need a proper plan and resources to tackle it. BBC Bristol featured this on radio and Points West and it was picked up positively by the Post. I helped scrutinise the second phase consultation findings from the citywide libraries consultation, asking questions on the council officers’ (aka staff) proposals. I was pleased to learn that the Friends of Redland Library group I have been involved in had real impact – our public awareness campaign bumped up public response rates in the final few weeks of the consultation, and the creative suggestions in our group consultation response were praised by the officers as some of the more interesting. I made a statement about improving housing standards in the private rental sector by adopting the ACORN Ethical Lettings Charter. I encouraged the Mayor to adopt this alongside the West of England Rental Standard, because the former is a code of good practice, while the latter is just about legal minimum requirements. I read and listened to public representations and officers’ reports, and contributed to decisions on an extension to student flats on Whiteladies Road (I voted against, but it passed), and the outline plan for new buildings at the UWE Bower Ashton site (committee voted unanimously for). BWC is challenging all parties to field at least 50% women candidates in winnable seats, and encouraging individual women to come forward. I am supporting this campaign because I know that for democracy to work well and good decisions to be made, you want a diverse group of decision-makers. If a majority of the decision-makers (whether in a democratic setting or a commercial one) have similar backgrounds or life experiences, ‘groupthink’ can become a real problem. Diversity brings a variety of lived experiences, and a variety of ways of looking at problems, and solutions. So even if you don’t care about equal rights, and care only about the Council making sound and rational decisions, you should still support equal representation. The Green Party now has 14 councillors on Bristol City Council; 7 male and 7 non-male (one identified as genderfluid). And we are pretty proud of that. However, I am the first to acknowledge that this was partly down to fortune with who got elected and who didn’t. We did not achieve this with all-women shortlists (which is Labour’s strategy nationally) or quotas, but (aside from the good fortune) simply by everyone in the local party putting effort into encouraging women, young people, black and minority ethnic (‘BAME’) people, and people from other underrepresented groups to step forward. The 50:50 target for winnable seats in the “all up” elections next year (all 70 councillors, the mayor and the police commissioner are all up for election in May 2016) still represents a challenge for us though. This is especially the case because, based on past experience, women are often more hesitant to stand in winnable seats because of the time commitment involved in both the campaign and the councillor role itself. Such a time commitment is, for some, incompatible with the caring responsibilities that women still generally carry more than men. Personally I’m not a fan of the ‘hard’ style positive discrimination of all-women shortlists, I believe the way forward is a ‘softer’ but energetic encouragement, coupled with providing really substantial support to equip people with what they need to stand for election, which could be public speaking or leadership training, or a flexible campaign strategy that fits around candidates’ other commitments. So we’ve still got a way to go. Not to mention that the 14 of us are pretty white (although count several with immigrant backgrounds in our number) and predominantly middle-class; definitely two more areas to work on in 2016! But I want to take this opportunity to highlight a coincidence, one that makes me proud to be a Green. 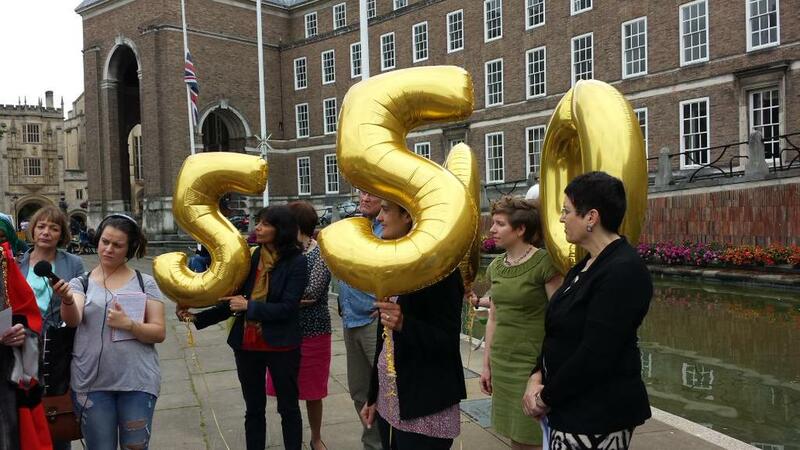 Yesterday afternoon in Bristol we clutched “50 50” balloons, and the Mayor joked about the idea of a “job share mayor” as the only way to encompass 50:50 representation in his role. Meanwhile, two Green Party members in Basingstoke prepared for a hearing with a high court judge in their push to ensure equal opportunities for women and those with disabilities to stand in parliament, by allowing MPs to job share. 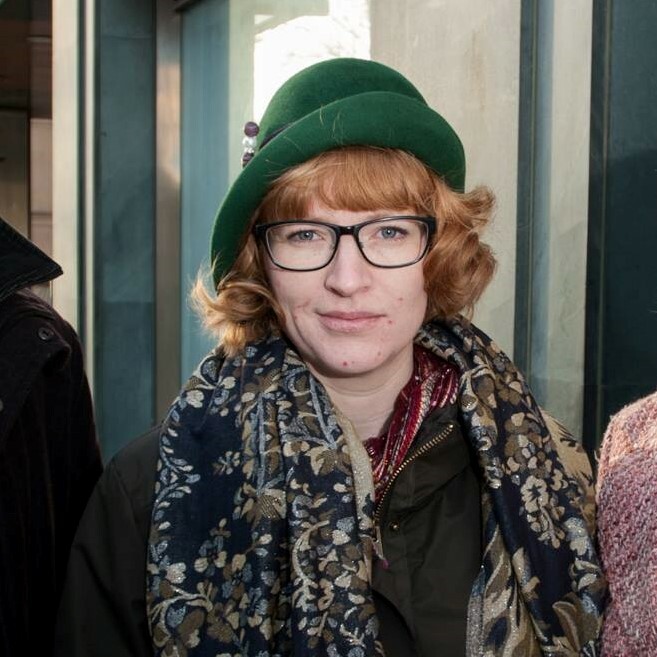 Green Party members Sarah Cope and Clare Phipps’ request for joint candidacy was rejected by the Electoral Returning Officer at Basingstoke and Deane Borough Council on the grounds of a ban on job-shares for MPs. It is shocking that the total number of women who have ever been elected to the House of Commons over the last century are still outnumbered by the number of men sitting as MPs today. Many of those, like Sarah and Clare, who would be amazing MPs have children, family responsibilities or have disabilities, which means that they can’t be a full time MP. Allowing MPs to job share would unlock the potential of these disadvantaged groups, and allow for people from a wide range of backgrounds and with a variety of skills to contribute to our society. If you are non-male and inspired by Bristol Women’s Commission’s campaign, feel free to get in touch with me to discuss what being a councillor entails. Gender isn’t binary, so if it were up to me I’d rephrase this campaign, calling for at least 50% non-male councillors. It may not be as catchy, but it’s more inclusive. LEADER’S BLOG: Two months in – how are Green councillors taking to their new roles? Ani has found a large quantity of her time taken up by casework. Cabot has a severe lack of appropriate waste disposal for both residents and businesses – which is particularly unpleasant in the heatwave but it will be easier now that the council are bringing waste back in house. Ani has been discussing homelessness and rough sleeping with agencies such as Streetwise and fellow councillors and hopes to bring some positive news soon. She has also been talking to small businesses about how they can be better supported. There is the potential for a BiD (Business Improvement District) for Old City and surrounding areas. Ani is working to ensure that all small businesses that want to be included are given the option. Ani has also found time to set up monthly surgeries in the “ward corners”, the first of which was on Wednesday 1st July in WUF houses, Redcliffe. She plans to hold more in Kingsdown and Harbourside. Dani was elected as the first ever Green councillor for Cotham ward. Dani has taken a lead role in establishing the ‘Friends of Redland Library’, a group of local residents and library users, who want to protect Redland Library. She’s worked with this group to draft a response to the Future Libraries Consultation that reflects residents’ views and aspirations for the future of the libraries. Dani has been working with Cotham’s neighbourhood officer to convene a Young People’s Working Group to engage young people in the neighbourhood partnership. Students from Cotham School and from the Youth Council came along to their first meeting to talk about how they would like to be involved in making decisions in their neighbourhood and what sort of initiatives might most benefit them. Casework is helping Dani to find her way round the Council – from queries about chickens to planning objections and how to get double glazing in a conservation area! 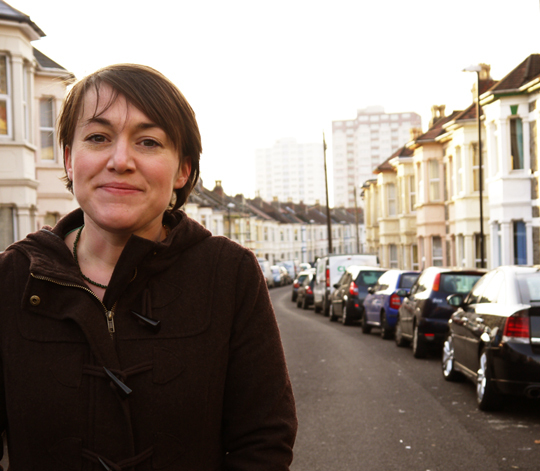 Carla was elected as the first ever Green councillor for Clifton East ward. > Helping a local business find funding for sustainability improvements. > Attendance at local Residents’ Association meetings etc, and being available for questions. > Perennial problems with overflowing bins, noisy neighbours, student relations. Carla has already been working hard on priority (2) by co-founding Friends of Redland Library with Dani Glazzard (Green Councillor for Cotham) and others, and submitting a joint response to the libraries consultation. She looks forward to getting started on the other two priorities soon. Carla also has a seat on the following committees: Development Control B Committee, Neighbourhoods Scrutiny Commission, and working with Greens in the Place directorate on energy issues. 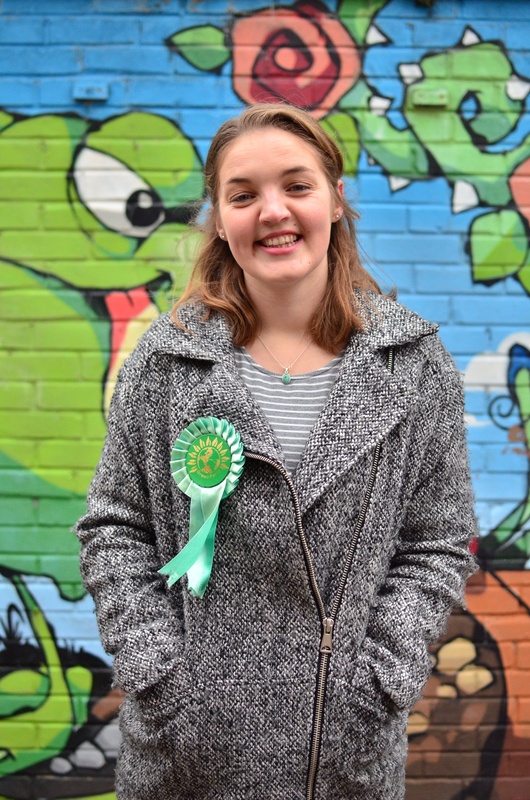 Anna was elected as the first ever Green councillor for Easton. Anna has been working on two areas in particular – sustainable living and the street environment. Work on sustainable living has included: work with residents about the Warm Up Bristol scheme to insulate houses in Easton, including meetings with council staff delivering the scheme to encourage better service for residents and improvements to communication and problem solving; consultation with residents about getting some bike hangars installed in a few places around Greenbank. Work on street environment: Anna has been taking part in a bin consultation and door knocking people to talk about litter and solutions near Stapleton Road; working on getting a fence replaced in Bellevue Park; sorted out some pest control to come to get rid of RATS (!) coming from a sewer on Eve Road; getting some signage sorted about caravans in central Easton, met the Playing Out team. Anna is also taking a seat on the following committees: Development Control A Committee, Public Rights of Way Committee, working with Greens in the Business Change directorate. 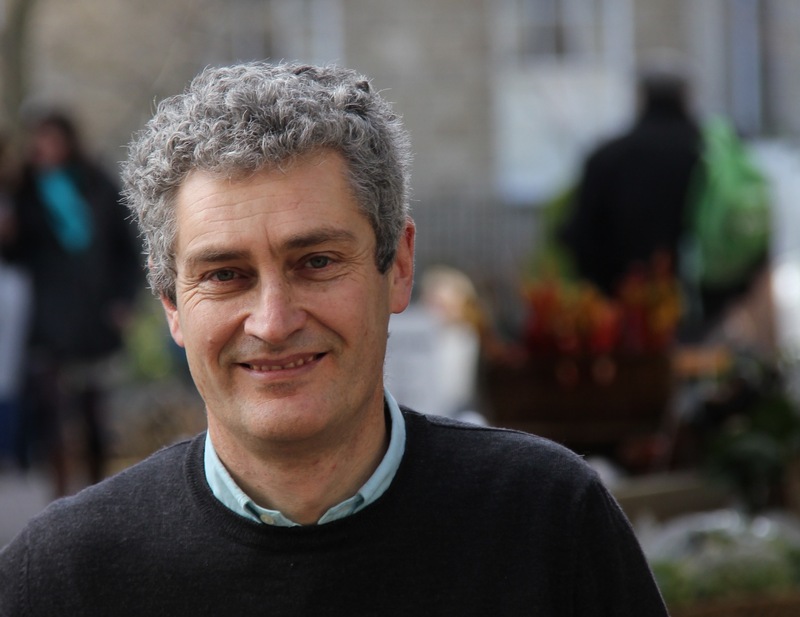 Martin was elected as Redland’s first Green councillor in May 2014. He has recently been joined by Fi Hance, who decided to join the Green group from the Lib Dem group after the elections in May 2015. Martin’s main preoccupation is the future completion of the Bristol North Baths redevelopment (library, health centre, flats, toilets). Initially held up by quality issues necessitating a pause to construction, it is now way behind time and delayed latterly by the developer running out of cash to fund completion. Work is proceeding v slowly and there are now doubts on the planned move of the GP practice into the complex, which was the original rationale for the baths building to be turned over to a developer since it would remain a community facility. Martin and Fi are also taking an interest in the work of the Business Improvement District where progress has been slow since the traders’ board was created for part of Gloucester Rd. They have both also been pursuing news of various traffic/highways projects in the ward due to very slow progress and the fact promised schemes for cycle safety works at the Zetland Rd junction have never materialised after funding was gained. The Bishopston, Cotham & Redland (BCR) Neighbourhood Partnership (NP) has recently undertaken a ‘road safety’ action day dealing with drivers and cyclists’ behavior at junctions. A work programme is being developed for Sustainable Travel in BCR. A recent success is the Heatview project funded by BCR Green Capital grants. This has already (before the end of winter) mapped many homes across the NP for infra red images that can be used to reveal heat loss. The website www.heatview.co.uk can be used to check heat images against normal street view images and signposts help and advice on energy saving. It is being used to support a new neighbourhood energy group in the area that Martin is helping get going. Martin is the Green lead on the Neighbourhoods scrutiny commission – which includes environment and leisure, housing delivery, crime and disorder, recycling, waste and environmental issues, neighbourhoods, and public health. Martin has led on input for the new civic year’s agenda, promoting a sustainable waste and resources focus for the review of waste and recycling services. He has emphasised reduce/reuse/repair and recycle rather than means of recovering energy from residual waste. Martin has also advised on questions around the Bristol Energy Company and taken part in the approval for the new Bristol Waste Company at Cabinet. On libraries, the committee is about to review feedback and proposals based on the second public consultation. Martin is the Green lead on the Development Control A Committee, which has so far dealt with the council’s response to developments at Filton Airfield. Martin also has the Green seat on the Downs Committee where he has worked with local parents on the Cycle Sunday events that now have created access to family cyclists on the Downs. Redland councillors also have a regular column in two local magazines and are planning a new e-newsletter to local contacts we have assisted. Daniella’s main objectives for the year as Assistant Mayor are a good Green waste policy and some sensible changes to neighbourhood partnerships to make them better, involving the devolution of power. A recent Cabinet reshuffle meant Daniella gained the sports portfolio. She has been to a meeting of the Sports Partnership, and will be focussing on grassroots participation, women’s sports and ensuring the partnership has good processes in place to ensure it is representative of the wider sports world in Bristol. In her role relating to safer Bristol she has been involved in the implementation of the Counter-terrorism Bill, but it is called Building the Bridge in Bristol. This involves sitting on the Board and also helping develop the Council’s thinking on how to tackle Far-Right extremism. Finally, Daniella looks forward to the launch of the 50-50 campaign by the Lord Mayor on the 15th July, aiming to get women to make up 50% of Bristol’s councillors by May 2016. She has been chairing the group that produced the campaign through the Women’s Commission and working on it for the last few months. Keep your eyes open for further news and campaigning on women councillors in the next few months. In Daniella’s ward, Bishopston… Tim is working with the Ardagh group, they are making good progress with the project and an initial expression of interest in community asset transfer has been made to the council. // A successful neighbourhood forum was held on the theme of secondary education – a subject close to many of our residents’ hearts. // Road safety, particularly around Ashley Down Road, as well as nuisance issues relating to noise and smells from local businesses continue to feature in the councillors’ casework. Becoming the group leader has meant an increase in media requests, councillor group administration and invitations to public events. Balancing this with the needs of an inner city council ward is certainly challenging, but no two days are the same and I’m really enjoying it. Ashley ward has recently had another Residents’ Parking Scheme implemented in Montpelier and there are renewed calls for schemes for St Andrews and St Werburghs as commuters’ vehicles spill into these areas. Gus and I are potentially using the Mayor’s Parks & Play Fund to get some outdoor gym equipment in Albany Green, and there is a new community project being developed by Sustrans in conjunction with residents called “Imagine St Pauls”. There are fothcoming major planning applications at the Carriageworks/Westmoreland House site (St Pauls/Stokes Croft) and at the Brooks Dye Works site (St Werburghs). I will be sitting on Overview and Scrutiny Management Board and Licensing Committee this year. In two weeks: the other seven Green councillors will give their updates! Author robertjessetelfordPosted on July 10, 2015 November 6, 2016 Categories Uncategorized3 Comments on LEADER’S BLOG: Two months in – how are Green councillors taking to their new roles? Jerome Thomas is the Green Party candidate for Clifton. He is the director of Strategy and Risk for the business Metrosafety which he set up with his business partner in the early 1990s. Why are you standing to be a councillor in Clifton ward? I want to play a part in building a constructive, inspiring, fairer vision of the future in the community where I have lived for over 20 years and where I’ve raised a family with my wife Catherine. I’m standing for the Green Party because I think we need a radical and changed approach to how we live in the world. The Green Party is asking the right questions and providing relevant answers. What do you think the important local issues are at the moment? There’s a lack of appropriate community centre facilities and the threatened closure of the library raises the risk that one of the few community facilities in Clifton will be taken away. But it also gives us an opportunity to envisage an improved library and community centre which could significantly benefit the community in the coming years. Providing better transport solutions and making walking and cycling safer. There’s a real lack of public transport within Clifton and there are plenty of opportunities to make walking and cycling safer. I’d be keen to see a 20mph limit introduced onto the Hotwell Road to make it less like a dual carriageway and more like the Whiteladies Road and Gloucester Road. Upper Belgrave Road would also benefit from a 20mph limit and this would actually help with the flow and the speed of traffic. There are places where we need improved crossings, to improve safety, such as the crossing at Merchant Road opposite The Pump House. Air quality is becoming a serious problem nationally and in the ward it is a particular problem on the Hotwell Road, where levels of particulates and Nitrogen dioxide often breach safe European standards. It would be valuable to be able to monitor air quality locally on a regular basis and for people to have access to that. We need get into place effective policies for reducing air pollution. There are always exciting creative initiatives emerging from Clifton and Hotwells. For example, a number of people have got permission for the closure of the Portway for five Sundays this summer. It is great to be able to support that initiative for people to be able to enjoy the Gorge without the everyday roar of traffic. If people have voted Green locally before, why should they vote Green for the parliamentary election? The Green Party is the only party that genuinely has care for the planet and for social justice at the core of its being. When Jack Straw was parading his ability to operate below the radar for big business in Brussels, it was an important reminder of how politics can often work in practice. Caroline Lucas has shown the huge influence one principled, capable, caring MP can have. Just think of the difference two or more could make and how Darren could contribute as an additional radical Green and capable voice in Parliament. What’s your background? What are you passions? What are you up to at the moment? I’ve always been motivated by community and active citizenship and making a difference. In terms of my background, I grew up as part of a large extended family in the north Cotswolds, I went to Chipping Camden Comprehensive School. I then studied Politics, Philosophy and Economics at Magdalen College, Oxford before joining an American management consultancy in the mid 1980s. Unable to cope with its modern feudalism, I then spent a couple of years working for a community project with unemployed people in west London before starting my own business. That business, which I started with my business partner, is now a national safety business with over 80 employees. I’ve been fascinated by the challenges of developing a business with a social conscience and developing the skills to make organisations work better and more effectively. I was a Labour Party member for 25 years and was particularly active in Bristol in the run-up to the 1997 Election. 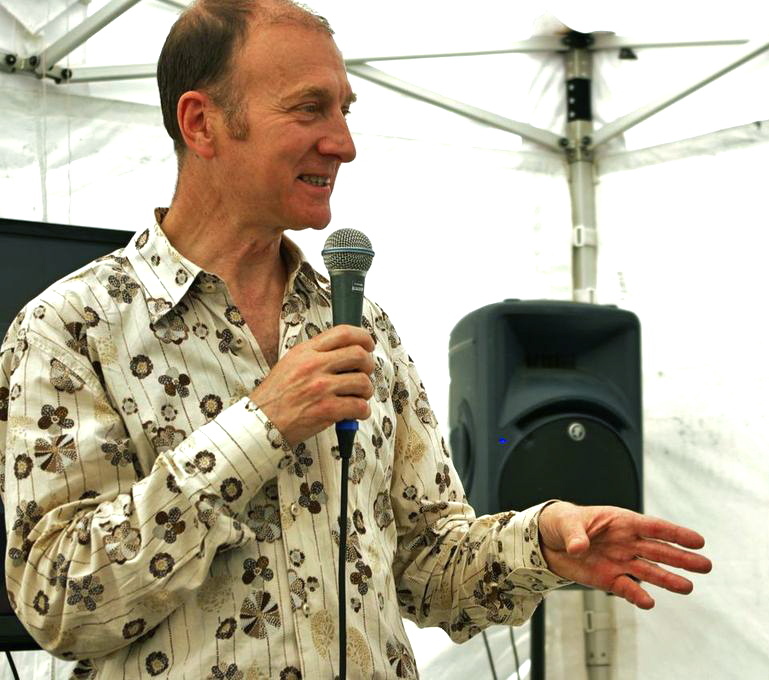 I was a trustee of the charity the British Holistic Medical Association for 10 years along with my wife Catherine who is an holistically-minded GP and lead doctor at the Penny Brohn Cancer Care Centre. A key shift for me in my Green political approach was attending a two-week course in January 2012 at Schumacher College in Dartington on green economics and business. From that, I was inspired firstly to join the Green Party, and secondly to play a more active part in the area of energy, which I feel is at the heart of the changes that we need to be involved in in society. Following from that, I became Chair of the Energy Action Group as part of the Bristol European Green Capital year and have served on the Green Capital Partnership steering group, as well as being a member of the panel which awarded the small grants for Green Capital year. I feel very positive about the way in which the Green Capital year has given organisations and people with great ideas the opportunity to make a difference and to sow the seeds for the radical changes in society that we need. Are there any other local or national issues that you think are going to be important in the next period of time? Taking a broader perspective on city and regional government the experience with the independence movement in Scotland has shown us how politics can become revitalized. The Green Party in Bristol may be helping us forge our own distinct Bristol political identity. It is very encouraging that all the major UK political parties are starting to sing the benefits of regionalization after decades of centralization and emasculation of local Government. The combination of the Green agenda and regionalization presents exciting opportunities. This could be in the areas of transport, energy, health and education. But balanced against that is the reality of the severity of the cuts currently being imposed by central Government on Bristol. Many voters are irritated with mainstream politics and mainstream economics. If politicians can’t provide the old fashioned benefits of economic growth and rising living standards in a stable environment then people begin to seek credible alternatives where they can help shape the solutions. This frustration with the failure of conventional approaches has found a voice in the margins including in the Green Party but is likely to become increasingly mainstream in the next few years. At the moment voters are more irritated and resentful with the failure of the old than they are excited by the possibility of a new and transforming society. On a global level I start from the principle we only have one planet to live on. In an increasingly globalized and competitive world we need to better work out how we can lead healthy, happy lives within that overarching constraint – whether that is in the area of food, transport, energy, housing, or nature. This also includes working out working as communities across the city, the country and the world to reduce the likelihood of climate change and mitigate its effects. The Transition movement has provided a strong framework and inspiring examples of how we can make these sorts of changes. The Green Party can have an important role in bringing them into the mainstream. If you were Mayor for one day and you could change one single thing, what would it be? Introduce an ultra-low emissions zone for vehicles. Jude English is the Green Party candidate for Lawrence Hill. She is a Bristol-based teacher and Open University course coordinator. Why are you standing to be a councillor in Lawrence Hill ward? It’s the place in Bristol I moved to and kind of took me in when I moved from Cardiff about 18 years ago. I came and was housed by self help community housing by Charlotte Keele Medical Centre and I had a really happy five years living there. What I’m hearing on the streets and in neighbourhood forums when I go to hear what people have got to say is street cleansing and tidiness. I know that’s kind of an old chestnut, but people are really fed up of the lack of attention to the streets of BS5, Lawrence Hill and Barton Hill. They want a proper service, like that people get in other parts of the city. There’s refuse piled up from flats, from businesses – and it’s just become tiresome. Also, I think there are issues about schools. We need more places for young people in schools. I’m a teacher, I’ve been in several primary schools in Lawrence Hill recently. There are large classes – I shouldn’t be teaching classes of over 30 kids in a primary school in Bristol. There’s also a huge mix of lovely young people speaking many different languages. We need more help and support for them – for interpreting, we need extra teaching assistants. I’m hearing this: “I’m really worried about the Conservatives getting in so I think I should vote Labour.” I can understand people’s worry. It is a concern, isn’t it? None of us want to have any more time with this dreadful Conservative-Liberal coalition. But Labour….are they delivering the goods? Have they delivered the goods? We might think some of their policies are OK, but on the ground people want change. If you want change, you have to vote for it, you have to see it happen, you have to make it happen. Don’t be frightened of that message – it was in the Green Party’s fantastic new party election broadcast. I know that resonates with a lot of young people. We can’t have the same old tune, you have to have the courage of your convictions and you’ve got to make it happen. Green is different. I like to think we’re socialists at heart and if you look at the policies, most people really agree. So don’t be frightened. Fear is what is stopping people from voting Green sometimes and so what I try to do is reassure people that it’s not a wasted vote. I certainly would not waste my vote, it’s a very precious thing to me. My background is in environmental youth work. I started off many years ago working for an environmental youth charity. I worked for Friends of the Earth for a while. At the moment I work for the Open University for some of my time, teaching on a course called “Energy for Sustainability” where I help people who haven’t accessed university level education before to gain a degree, which is very satisfying. 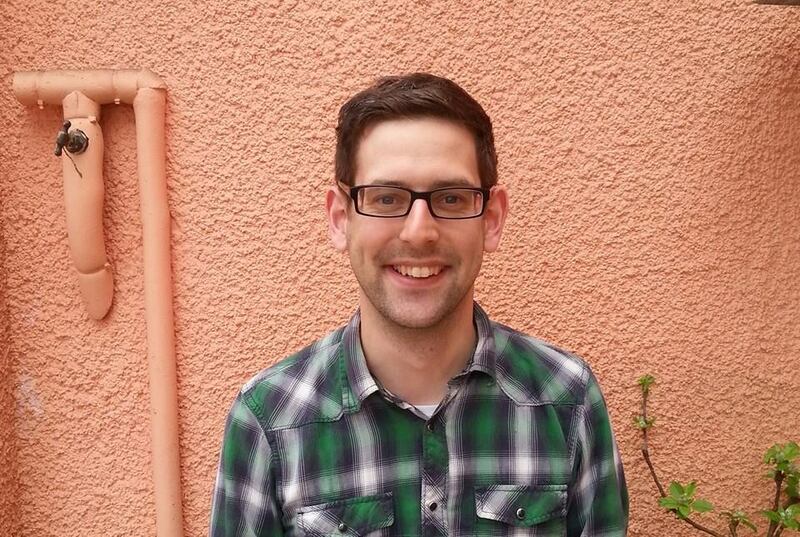 I also work in schools – I work as a supply teacher in a number of schools in Bristol. At the moment I’m teaching in a secondary school in Lawrence Hill. I started off as a physicist. Physics is about the natural world. Physics is about how the world works. It’s about climate and weather and mountains and animals. For me, this is all related to how we care for our resources and over the years I’ve recognised that we are not caring for our resources in a very sustainable fashion and we are going to kill the planet, effectively. One of the most famous physicists, James Lovelock, thought of the Gaia theory which people don’t recognise enough, I think. The planet is a living thing and we are killing it. So I’m passionate about that, and all things really connect to that, for me. For the new council it will be taking forward the legacy of the fantastic Green Capital year. We’ve had £7m from government and we’ve had the energy and enthusiasm of all the Bristol citizens. It’s not just for one year. We need to be the green capital of Britain and possibly Europe and further afield. We need to role model all these new technologies. We need to have our fantastic young people in jobs where they are doing worthwhile and meaningful work in green technologies, gifting this and spreading this throughout the planet. I would make the entire city centre of Bristol car free. 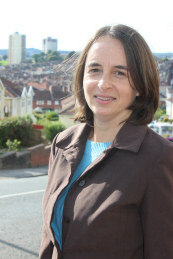 Carla Denyer is the Green Party candidate for Clifton East. She is a renewable energy consultant, based in Bristol. Why are you standing to be the councillor in Clifton East ward? I’m standing as the Green candidate because I realised around four years ago that my values aligned very well with the Green Party’s. I’ve been involved in the party ever since then, but this is the first time I’ve stood as a candidate. 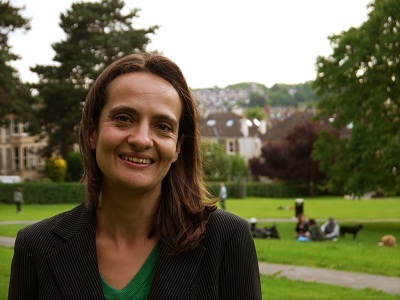 I’m really excited by this opportunity to represent the people of Clifton East on Bristol City Council – and I hope I’ll do a good job. 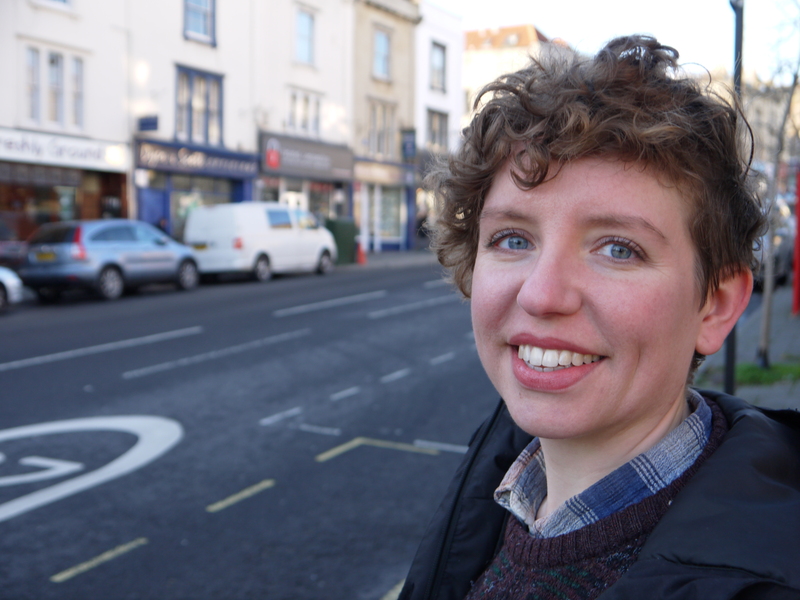 The reason I’m standing in Clifton East specifically is because it is near where I live (I don’t quite live in the ward but not far away) and it is within Bristol West which is the constituency that we have a really good chance of winning this time around. I was already involved in the campaign for Bristol West and I thought one of the best ways to help that campaign would be to run as a councillor at the same time. What are the biggest issues facing Clifton East as an area of the city? My number one priority is better transport and travel options. The Green Party would like to see an integrated transport authority in Bristol (similar to Transport for London) which would help public transport services to be better linked up, and for there to be a unified ticketing system (a bit like an Oyster card). It just makes so much more sense and makes public transport a viable first choice for people rather than their last resort, or their begrudging first choice – because they know it’s better for the planet but it’s not very convenient. I think this is the situation that a lot of people are in at the moment. I think that Clifton East has some reasonable public transport at the moment. We’ve got a couple of good bus routes going through it, and Clifton Down station. It’s great that they’re there, but they’re not very frequent, they don’t run very late into the evening so they’re not really that useful for a lot of people. And ultimately I think public transport should be run for the benefit of people and be as convenient as possible, not to maximise profit. Community facilities could be improved. There isn’t a single community centre or anything like that in any of Clifton East ward, or the neighbouring Clifton ward. The closest thing we’ve got is a couple of libraries and those are both at threat of being closed down. So I think we need to fight against the potential closure of those libraries – we are already doing so in fact – and there need to be more opportunities for people to engage with their community and if they don’t have a hub to do that, then it’s always going to be difficult. The Green Party have been focusing a lot on the Ethical Lettings Charter that the ACORN community union proposed and Green councillors got passed recently at a Full Council meeting. Clifton East, and the neighbouring ward of Cotham, have a really high proportion of renters, much higher than the rest of Bristol – which is itself higher than the national average. A lot of those are in large houses, converted into many small flats, and often not in good condition. Landlords are charging high rents and estate agents are charging high tenancy fees, which makes it really difficult for people. So the Ethical Lettings Charter is a voluntary code that letting agents can sign up to, to say that they won’t charge tenancy fees, will not make revenge evictions, will ensure a minimum energy efficiency, and various other steps to protect tenants’ rights. Ultimately, I’d like it to be law, but this is a great first step. People may have voted locally for the Green Party, but why should people vote for a Green MP? Because if you’re ever going to vote Green nationally, now’s the time to do it. This is the year when you can vote with your heart and your head – you don’t have to choose one or the other. If you agree with Green policies, then Bristol West is the seat where we’ve got a really good chance of getting in. It would be so powerful to have another voice in Parliament – to have Caroline and Darren. The result of the election is so unpredictable and we don’t know what the composition of Parliament is going to be. It’s looking unlikely that any single party is going to have a majority. The more representation of smaller parties, the wider the range of views in Parliament we can get, the better. What’s your background? What are you doing at the moment? What are the passions that drive you? I’m an engineer in my day job. I work in the renewable energy industry, for a consultancy based in Bristol. I got into that because about halfway through my degree, I had a bit of an epiphany about environmental and social justice issues and how related they were, and I felt that I really had to do something about them. So I looked at the trajectory my career was already on – mechanical engineering – and tried to figure out how that best overlapped with my values. Obviously with mechanical engineering I could have gone off and done aerospace, defence, cars… lots of avenues that I deliberately didn’t go down, and decided that sustainable transport or renewable energy were the things I would focus on. I was very lucky to get this job in Bristol after I graduated. I now work in that job four days a week, which was a deliberate choice back in 2012 to be able to spend more of my time on campaigning, including the Green Party. What do you like most about Clifton East and being around this area? It’s mostly a residential area, there are not a huge number of businesses in the ward, so perhaps a lot of people don’t know it well or have reason to go there very often, but I recommend it! It’s obviously got the well-known and busier areas like Whiteladies and several nice cafes and restaurants along there – I was already fond of those. I’ve got to know it even better as I’ve been canvassing, and found lots of lovely little quiet streets that I think most people don’t know exist, and it seems a lovely place to live. What other challenges are there locally and nationally? Austerity’s got to be the main one. Reversing all the different varieties of privatisation that have been happening thanks to the current government has got to be a priority for whatever combination of MPs gets in in May. I’m passionate about bringing rail and public transport back into public hands, keeping the NHS public, stopping the creeping privatization of our universities. I think the Greens have got by far the most credible policies for addressing those. The SNP and Plaid Cymru seem to be leaning the same way as us, so I hope they get MPs elected too. If you were Mayor for the day, what single thing would you do? Ani Stafford-Townsend is the Green Party candidate for Cabot ward. Ani works as a theatrical milliner and runs her hat-making business out of a shop in St James’ Arcade, Broadmead. Why are you standing to be the councillor in Cabot ward? I’m standing first as a voice for independent business. Cabot is home to a lot of businesses: big retail businesses, big other types of businesses, and then there’s loads of little businesses that you don’t really think about – especially in Broadmead and Park Street. You don’t really think of Cabot as having little businesses, but there’s a lot – and there’s no voice for them. Because they’re little businesses they don’t have anybody to send to big meetings on their behalf and for the residents who live in Cabot it’s those sorts of things – the little businesses, the coffee shops, the cornershops, all those places – that make it a nice place to live and stop it from being a soulless city centre which nobody wants to visit. They stop it from being just about the nightlife. It has to be mixed for it to be a pleasurable place to live. It’s also quite disjointed because it’s such a big ward – so vast and different, and very diverse as well. It’s quite easy for residents to get lost in it because it is so much about business as an area. So I think it’s very important to make contact with and be able to speak for residents who get forgotten and small businesses that get forgotten. What are the biggest issues facing Cabot ward as an area of the city? Housing is definitely a big issue. There are huge swathes of social housing. There’s also a lot of increasingly expensive housing so people who have always lived in Cabot can’t afford market rates and certainly can’t afford to buy anywhere. The social housing that exists – the new provision – is smaller and smaller and smaller. The older housing provision is getting more and more run-down. The social housing providers, seemingly, aren’t putting much money back into that social housing – certainly not the social housing that’s in older period properties. There are some terrible conditions that people are living in. There are other issues. Transport and the corresponding terrible pollution is a big concern. School provision is quite lacking as well. It’s not a very family-friendly area but obviously there are a lot of people with families who live here. I think there’s a lot of marginal communities in terms of people who have come from somewhere else and are getting shoved somewhere and they feel very segregated from everybody. There are also a huge amount of students, who are transient as well because it tends to be first year or overseas students in halls – they’re very segregated and gated away from everybody else. It’s a very segregated and disjointed community. Also, the thing that I keep hearing over and over again at neighbourhood forums and community events is that nobody feels like they’re listened to. Across the board, across the demographics – no one feels remotely listened to or cared about. Cabot ward’s got a long history of returning both Liberal and Liberal Democrat councillors. You’ve had George Ferguson (Bristol Mayor), Stephen Williams (current Bristol West MP) as councillors, and more besides up to the present day. Why do you think liberal voters in the area should vote Green this time? The Lib Dems have moved very far away from where they used to be. It’s very easy to fall into a trap of voting how you’ve always voted. I voted Lib Dem (as a student) because I looked around at the parties and it was the Lib Dems who were most closely aligned but they’ve moved so far away from those principles they had say, 10 years ago, which was when the likes of Stephen Williams got their strong return. They’ve changed. Tuition fees, being against the Iraq war – all of those things the Lib Dems stood for – they don’t stand for that any more. That’s why I don’t vote Lib Dem any more, because I’m looking for a party that does actually align with my principles and the same for everybody else. When I speak to students now, for whom many this is the first time they’re going to vote, they’re so astounded that students used to vote Lib Dem because of how far from the common principles of the student that the Lib Dems are. I’m from Bristol. I moved to London to study but then came back. It’s a very different city now to how it was in the 90s when I left. My background is doing theatre millinery and theatre costume and I still do millinery now. I’ve also done a huge swathe of other things. When I worked in London I worked for a drug rehabilitation service that helped cocaine users get clean in Battersea. When I came back to Bristol I worked for a company called SocialData who did sustainable transport research, working with Sustrans and I ran a couple of projects with them encouraging people into cycling. I’ve always been into the green activism stuff without using the terminology of an activist. It was just something that you did: you cycled and recycled. You did all those things because it’s the right thing to do. Increasingly I am seeing how lucky I am to be as old as I am – in terms of education – because I just got in before tuition fees. Seeing my younger siblings-in-law and children of my friends getting to be 18 and going to university brings that home. The future for them – as well as the future for my own child – is looking quite bleak. My father has disabilities and I have a lot of friends with disabilities. We must fight for the support that people need financially through the benefits system. It’s been completely taken away. These last five years, austerity has really bitten people. I did know it before but is really quite acutely felt now. It doesn’t matter what your background is, actually, or how hard you work. When you get bad luck at work and lose your job, then you’re screwed. There’s no safety net anymore and that’s also what I’m fighting for. What do you like about working in Cabot and being around this area? I like that it’s so interesting and diverse. I love how many people are squirrelling away, trying to make their business work and trying to work together – paddling furiously like ducks and trying to look calm on top. It’s so green – that’s what I love about Bristol generally – there are lovely parks and lovely places to hang out. It’s so multi-cultural. There’s everything you can possibly imagine in Bristol and it all sort of congregates in the centre, which is Cabot. The centre of Bristol has changed substantially in the last 20 years with huge increases in people going to live there. What do you make of it? My mother grew up in Hotwells and I’ve seen how much Hotwells and the Harbourside has changed from when I used to go to the Three Tuns pub every Tuesday and Friday when I was 17 and 18. It was just a little pub in the middle of derelict land and now I go to it and it’s surrounded by buildings. It’s not as simple as to say that’s “good” or “bad”. I’ve been in the social housing flats. A double bedroom means you can get a double bed in a room – no furniture, nothing else, you crawl into the bed from the bottom. I’ve also known people who’ve had penthouse apartments – huge huge flats. You could fit three of the social flats into one of those. And it’s so unfair! They’re all nestled up against each other and none of them have any outside space. The huge differences in quality of life for those people, nestling in the same bit of town. So many of those buildings still aren’t fully occupied, there’s empty houses there and all these empty office buildings too. I remember going on a boat trip when I was about 14, so we’re talking early to mid-90s. We went in front of the Lloyds building and I was told how these buildings we are looking at are empty office buildings but they were still building more because it was more valuable to keep building more office buildings! I remember thinking “how does that make any sense?” And that’s before you even take into account how many people needed a home, especially in the early 90s when we were coming out of the recession then too. My family had quite a hard time during the 90s recession. My dad hurt his back and also left Rolls Royce for ethical reasons, so we were really really poor when I was child. And seeing all these people who didn’t have anywhere to live and seeing all these office buildings built and everyone been quite honest about the fact that they were not occupied, they were empty, but that was the “best financial option”. It was wrong. 20 years later, we’re still making that same mistake. When will we learn? The obvious one is re-enfranchising those who are disenfranchised – getting people to come out to vote where they think there’s no point. This time around, there IS a huge amount of point because it is probably going to be a hung parliament and therefore every vote counts, especially in Bristol West! It’s a close-run thing. You can vote for your principles and vote for a Green MP and probably get one. Making a connection with people who haven’t voted for a long time is really important and getting them to vote – even if they don’t vote in the way that I agree with. As long as they don’t vote, nobody will listen to them and they’ll never ever get any help. That’s why the people who vote in a certain way – largely right-wing, more vocal – the anti-immigration voices are getting more air time because those people ARE voting. They aren’t actually the more popular voice, but they’re the loudest one. We need to change that. In Cabot, that’s a huge issue because there are a lot of disenfranchised voices. I would make sure that no one in the council was paid more than 10 times the salary of the lowest paid. Rob Bryher Create a free website or blog at WordPress.com.